Adventure Game Studio | Games | IWWHIIWWHITOMIROTPG: The Game! Based around the "I Wonder What Happens..." video series by Majus and Co., IWWHIIWWHITOMIROTPG: The Game! takes a (hopefully) humorous look at some of the zany things that Majus might decide to put Guybrush through whilst delving into the mysteries of what will actually take place in the Tales of Monkey Island. A long time passed since I was in the world of Monkey Island. Seeing the pictures of this game, memories from there slowly started to come back to me. Much talent and effort must have been spent to catch into drawings the spirit of those adventures. While short, this episode invites you to rediscover the charm of that lost world. Both in the puzzle(s) and in the various side interactions you will find the same light humor - a step further in restoring your soul connection to the game. 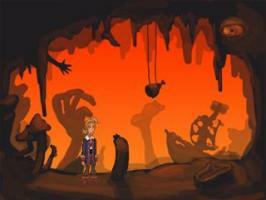 But then you will not be completely reabsorbed in the Monkey Island experience. The LucasArts magicians are not here to hide themselves behind a spell that makes the time stop and the game become reality. Instead you are welcomed by the joyous laugh of a team of MI enthusiats. And the voices reflect the bold and fresh enterprise of an independent movie. There are some experimental jokes there too. This game felt like a picture page from a story book, once torn and mislaied and now found. And perhaps you will wish to read the whole story again. Nice graphics, as can be expected from the list of authors. Be prepared for a very short game, that gets straight to the point... no wait, there isn't really much point besides the parody I guess. Awkward controls... but I guess this is part of the parody (though they work better in the Telltales game). It even has a voice track, though unfortunately it's quite lo-fi; I guess this last thing wasn't a parody, since the voice acting in the Telltales games is top-notch. Thanks to this game I learned about the very funny "I wonder what happens in..." (this and that episode of Tales of Monkey Island) at http://www.telltalegames.com/monkeyisland/episodes I guess the point is that this game falls before the 5th and final delivery of the "I wonder what happens in..." which hasn't been released to this date, yet.